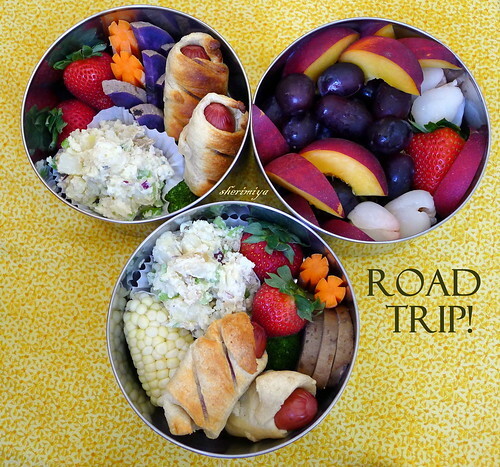 Roadtrip Triple Bento, a photo by sherimiya ♥ on Flickr. Yum, did you pack one for yourself as well? :) That's the worst part about road trips. Trying to find good food without undermining your driving schedule. I am finding inspiration in this bento for my upcoming trip to Seattle. I vow not to fall to the perils of plane food. Yuck! It was really fun making this bento set. I'll admit I wished I had a tier for myself too. I don't like stopping for food; it's a lot more fun to eat as we go. 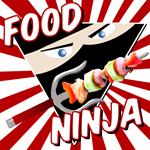 And of course, it's always much better tasting :D Have fun with your plane bento! How timely! I am in the midst of trying the much longer trip I've ever done in my life (13hrs! ), and have been wondering what to eat in the road. Deviating from the road can very easily stack 30min+, not to mention the expenses, and I can't have that. I love the idea of chilling the box before leaving and letting it warm up naturally... I must try it! That's awesome! I'm so jealous of your tiffin meals. I might have to go pick one up and make us a Disney road trip tiffin picnic, lol! The colors you packed in it are gorgeous! Now I'm thinking I should've gotten that 3 tier bento in chinatown the other day. What a great meal! I know it's piggy in a blanket but you sure know how to make it look gourmet. Yum! I've always been wary of using a tiffin due to my particular needs...but this has convinced me. I need at least one stainless steel set. AWESOME! Beautiful colors. I think you need that 4-tier too! gorgeous bento! You know I went through an Obsessive Phase over bento boxes, right? Well, I was especially drawn to the Shiny, Shiny tiffins. I want one 12 layers tall! And, as always, what you put in them is lovely, Sherimiya! And you're right of course -- I need to make me one next time! Heather; perfect! You definitely need one for the Disney trip! Jenni, you went through it, meaning you're over it? How did you do it? Even though I know I don't need ANY more, I still look around. And believe me, if there were any greater than 4-tier I would somehow try to justify it. Thank you! Haha when your kids get older, you will need 2 3-tier bento boxes! Such a beautiful lunch box! This is MUCH better than all the junk food you find on the street next to freeway to LA... I hope you had fun weekend!